Lawyers and law firms must comply with strict ethical standards. These standards extend to providing appropriate advice and legal representation for a reasonable fee. But a law firm's fiduciary duty to a client extends beyond fees, costs, and billing statements. Attorneys are also responsible for the timeliness and accuracy of advice they provide. This can include providing appropriate advice about potential tax consequences of your decisions, or the financial consequences of your actions. When an attorney is not sufficiently experienced or competent to provide advice in financial or other areas, he or she should inform you that you mush get the advice of another lawyer or law firm. When a lawyer's mistake causes damage beyond the loss of an underlying claim, the lawyer can be liable for damages if the lawyer had reason to believe that his mistake was likely to cause such damage. Breach of fiduciary duty claims take many forms and can occur from many aspects of the lawyer-client relationship. If you feel that your attorney has let you down, a breach of fiduciary duty lawsuit may be warranted. At the legal malpractice law offices of Konicek & Dillon, P.C. , we are committed to the high ethical standards of the legal profession. Our attorneys will help you understand the law and standards attorneys are expected to maintain. We will analyze your situation to see whether you have a basis for a breach of fiduciary duty claim. Contact an Illinois breach of fiduciary duty lawsuit attorney at Konicek & Dillon, P.C., to discuss your prospective claim against an attorney. To be an effective legal malpractice law firm, it is necessary to understand all sides of a case, and how the attorneys involved should have proceeded. 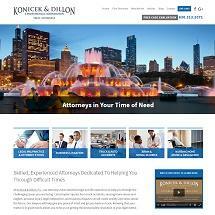 The attorneys at Konicek & Dillon, P.C. have years of combined trial and appellate experience litigating attorney negligence and legal malpractice claims. We invite you to visit our Attorney Malpractice page on this website to learn more about legal malpractice claims. Contact an Illinois breach of fiduciary duty lawsuit attorney at Konicek & Dillon, P.C., for a cost-free consultation about your breach of fiduciary duty claim. Illinois breach of fiduciary duty lawsuit attorney providing legal malpractice lawsuit, attorney breach of fiduciary duty lawsuit, lawyer misconduct, breach of contract litigation, and lawyer fraud legal services to clients throughout Illinois.